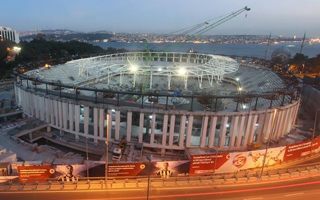 Launched two weeks ago, the big lift operation at Vodafone Arena has ended without major issues. There several minor corrections during the lifting, because all cables needed to go up at the same pace to avoid overload on any side. Now the inner ring rests at 41.5m above the field, where it was intended to be. As seen in the above photo, set of lower cables holds the roof in place, while secondary upper cables will soon be installed to provide support for translucent PTFE membrane. Secondary steel supports, floodlight and sound systems, finally catwalks for service crews will also be added to the roof within the next two months. Early into 2016 we should see the final shape of Vodafone Arena’s cover. After numerous setbacks there’s finally an opening date for the stadium. Not confirmed yet and dependent on construction pace, but it’s an important day: March 19, 2016. While the Antalyaspor game scheduled for that weekend isn’t symbolic itself, the date is.